Cleaning, decluttering, disposing of material, equipment, old legacy piping, etc. How do you get someplace just by looking around? Are there clear visuals to help me get there? At the core of lean principles is a focus on continuous improvement, and this workshop helped to bolster our collective commitment to seek out areas that we can, well, continue to improve upon! 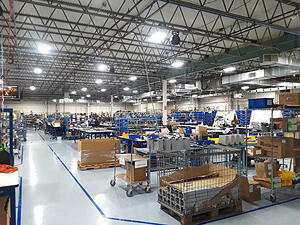 Click here to learn more about Fourstar's lean practices. The workshop used a performance-based, simulated manufacturing environment that provided a hands-on, experiential model for participating in a lean transformation. The goal of this workshop is to teach people how to eliminate waste and increase productivity and profitability, focusing on cycle-time reduction or manufacturing waste—as opposed to “traditional manufacturing philosophies [that] stress high utilization of machinery and manpower.” Of course, the ultimate outcomes are focused on gaining a competitive edge. 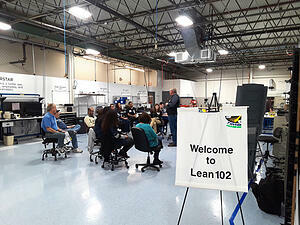 This workshop has helped to re-invigorate our lean commitment. It reinforces our overall approach at Fourstar, which is to address everything, but to start small and simple as a first step for every new initiative. Some things will naturally present themselves as you unclutter the space physically and unclutter your mind from what you couldn’t previously see as possible. In Fourstar’s case, in the last few years, we looked at signs, focused on inconsistent details, saw things like old tape that needed to be removed, cleaned areas and washed items, organized, kept what we needed, and got rid of what we didn’t. We created leaders, made capital improvements, and redesigned the workspace and workflow with a modular, mobile production model. Our drive to keep it lean has worked well for all parties involved—from the production floor, to C-Suite and business model focus, when developing new product introductions (NPI) and design for manufacturability (DFM) projects for customers, and in our supply chain relationships with suppliers.